Pleated shades, from single layer shades to cellular shades, are the most popular selection right now. In close contention, are the mini blinds and verticals. 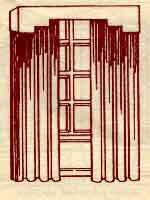 These window treatments have been a decorating mainstay for some tome and are available in many new colors and patterns. Although anything goes these days as far as style in the Bucks County area, the trend does lean towards the Traditional look. Starting with Sheers and Shades as an under treatment, you can finish off with Swags and Jabots or Cornices and other valances. Complete the look with side panels; straight or tied back. Swag and Jabots over side panels, with sheers or lace under-treatment. Upholstered cornice with full draw drape or side panels. Pickup type trumpet valance with tied back side panels and sheers. 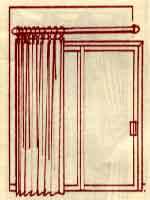 Window Treatments for sliding and atrium doors generally present more of a technical challenge to create. There are some very pleasing and practical ideas for you to consider. For essential privacy and protection from the sun, Verticals in fabric or textured, easy-care vinyl offer a handy solution. Topped off with a finishing Valance in a fabric coordinated to your room, the Verticals offer a beautiful solution. 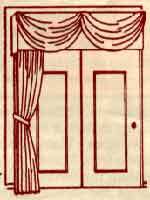 Alternative ideas are Pleated Shades attached right to the doors or a one-way draw Drapery on a decorative rod. For any selection, measuring and designing these window treatments needs to be performed with the utmost precision for perfect fit and appearance. Satins and Jacquards - Usually the most formal and traditional, they are generally made from tightly woven, heavy, soft material which hangs straight form top to bottom in (formal) folds. 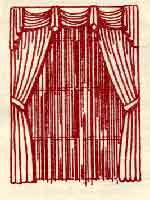 Lace and Sheers - Made of soft, see-through fabrics, sheers are appropriate in most decors. Light and air, they are sometimes used in combination with heavier draperies in more formal settings. 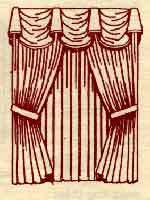 They are billowy unless weighted, and can be made to drape as well. Prints - Suitable in most decors, prints are made form a light, tightly woven fabric, usually cotton or cotton-polyester blends. 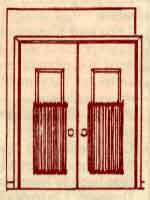 Casements and Open Weaves - These a have lighter, more casual feel. They are usually made form loosely woven, textured yarns that hang in looser folds than the formal Satins and Jacquards. 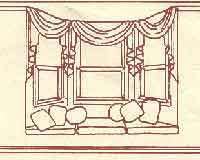 Drapery Linings - Linings add substantially to the luxurious appearance necessary for good window treatments, and also provide a fuller pleated look for maintaining a soft drapable hand. Multiple Windows, in small rooms - use lighter, airier window treatments such as Sheers and tone-on-tone fabrics. 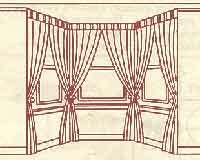 Multiple Windows, in various sizes - use valances to visually correct uneven window heights. 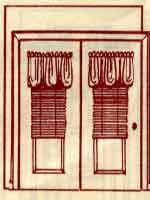 Match window shades in fabric and color. 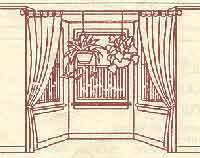 Small Windows - Valances and Swags need not cut down on the image through your windows if they are mounted properly. Be sure to have them installed 4-6 inches above the top of the window frame so that the treatments do not cover too much of the glass area. Only the top of the frame need be covered - remember, the more glass you have shining through, the bigger your rooms will look. One Final Note - You should never walk into a room and see only one decorating item. Everything from the floor, to the furniture, to the window treatments should flow into one another. Vertical or Traverse rods sticking and hard to draw? Sheers need to be cleaned? Wash the Sheers right in your washer on gentle wash and spin cycle. Immediately hang them outside on a windy day to eliminate most of the wrinkles. Most fabrics are treated with Scotch Guard or Teflon products to repel dirt. 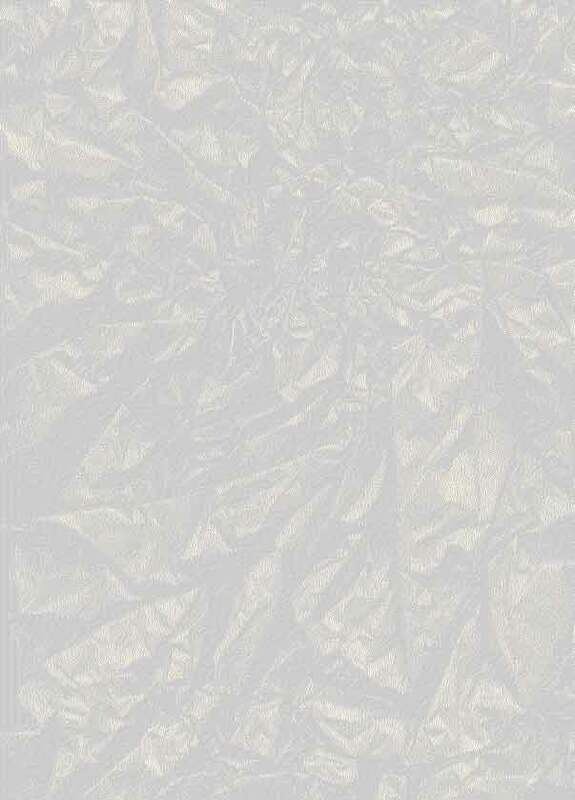 Dust will stay on the surface of the fabric and is easily removed. Simply toss the draperies into the dryer on delicate setting for 10-15 minutes with a damp towel. The majority of the dust will collect on the towel. Try using one or two fabric softener sheets for extra freshness.